HDMI 1x2 Distribution Amp Audio Converter - Video Over IP and HDMI Video Connectivity Solutions. The HDDA12 is a 2 Output HDMI Distribution Amplifier combined with audio converter. 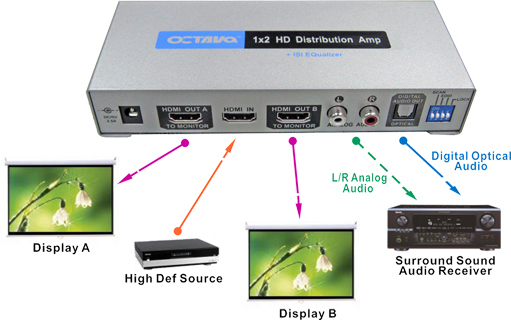 The HDDA12 converts incoming HDMI audio to 2CH Analog or Digital Toslink Output . Dual HDMI Video output enable users to display content on 2 screens simultaneously. Ideal for integration of video and audio amplifier and sound panels. The HDDA12 is designed to deliver reliability and ease of installation for commercial and residential applications where Audio integration is required. 2 HDMI outputs display HD video simultaneously on 2 screens. Digital Toslink Audio output for surround sound integration with devices such as the new Apple TV 4. Analog Audio Out : Supports LPCM audio format. Unit does NOT decode Dolby or DTS.